Why the Hype Behind Carrara Marble? Not all marble is the same. Marble is mined all over the world, providing a variety of colors and qualities, but not all marble is the same. For centuries, the furthest Northwest corner of Tuscany has been mining marble of some of the highest standards. The quarries of Carrara have produced more marble from their mines than anywhere else in the world. Ever. Marble is identified by it’s light, typically white coloration, and dark veins that are produced by mineral deposits. 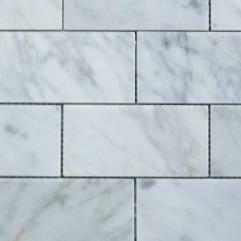 The veins from Carrara tend to be more linear and can be either dark or feathery. There are other types of marble that can be red, gold, or pink, but white to grey is the most common. Many building facades and statues throughout the world can be identified as being made with marble, more specifically Carrara marble. Carrara is most famous for Statuario marble which is virtually pure white, which happens in very few quarries around the world. So, why would you use Carrara marble for floor tiles in your home? Marble provides elegance and brightness that you simply can’t get with materials like granite. On the flip side, granite is a bit more durable. But with proper care marble can be a lasting addition to any interior or exterior. Perhaps you have a courtyard or patio area in need of flooring. Marble could be an excellent addition. Or perhaps you’re doing a bathroom renovation, marble floor tiles or even marble shower tiles could bring an elevated quality to the space. Contact Transworld Tile to learn more about the Carrara marble tile that we offer and the different possible uses for your home update.